I bought the fabric last June when I went to the Cotton Patch in Birmingham with Ady - lovely fabric from Sevenberry in a heavy cotton. I've been meaning to make it into a skirt, but somehow never got round to it. When Cam announced her "Make It in May Sew-Along" I decided this was the push I needed to finally make a skirt, so I signed up and hoped I find some inspiration and time ... I failed on both counts! Anyway, this weekend I finally made a decision and, before I could change my mind again, ran up the skirt above. 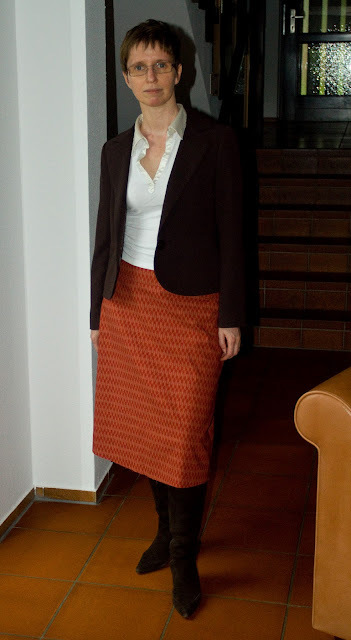 It's a modified version of Nikki's A-line skirt pattern ... modified to make it straighter (last weekend as part of my indecisiveness I altered the A-line skirt I made last summer - but never wore - to make it less A-line and this seemed to work better for me!) and I've added a lining so that I can hopefully wear it for more of the year. I still need to hem it, but thought I'd get in a photo before the light goes completely (it's a very gloomy, wet day here!) and my photographer disappears off on a business trip for the week! I think it looks smart enough for work (maybe after I iron it!!) but could work as a casual skirt too. Very smart indeed! I do like that fabric very much. I like your take on the A-line skirt, Fiona!!! Looks very smart with the blazer and boots. Looks great Fiona, definitely smart enough for work but can see it more casual too. One of these days I will work up the courage to sew some clothing, but in the meantime I will just enjoy seeing your efforts. Definitely looks good, and I'd say it's more than smart enough for work. Cool colour too! Absolutely gorgeous! I'd never thought of altering the a-line, but it's a brilliant idea to get a totally different looking skirt. Please do not copy or reproduce any of my photos without asking my permission.